If thick Greek-style yogurt is your favorite, this machine is designed with that style of yogurt in mind. The yogurt maker includes two 1½-quart containers for fermenting and straining the yogurt, a strainer that fits into the containers to make a thick Greek-style yogurt, and a lid so you can refrigerate the yogurt during straining, or for storage. If you want a standard yogurt, you don’t need to strain, just ferment the yogurt and refrigerate to chill. This yogurt maker has an adjustable digital timer so you can adjust it in 30-minutes increments based on the recipe you’re using, and it has an auto-shutoff when the time is up. This does not have adjustable temperature gauge. Yogourmet is one of the companies that sells dried yogurt starters, so they certainly know what it takes to successfully make yogurt. 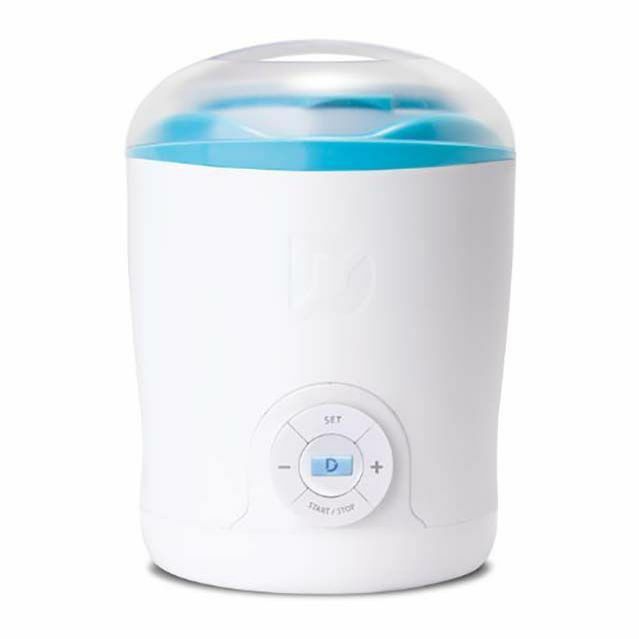 This 2-quart electric yogurt maker uses a water bath to keep the yogurt container at a consistent temperature, with no hot or cool spots, throughout the entire fermenting time. The inner container has a tight-fitting lid, so it can go right from the yogurt maker to the refrigerator. This includes a thermometer to check the milk temperature after preheating. For making Greek-style yogurt or yogurt cheese, this includes a cloth bag with drawstring that can be used for staining the yogurt, and the bag can be hung by the drawstring to drain. 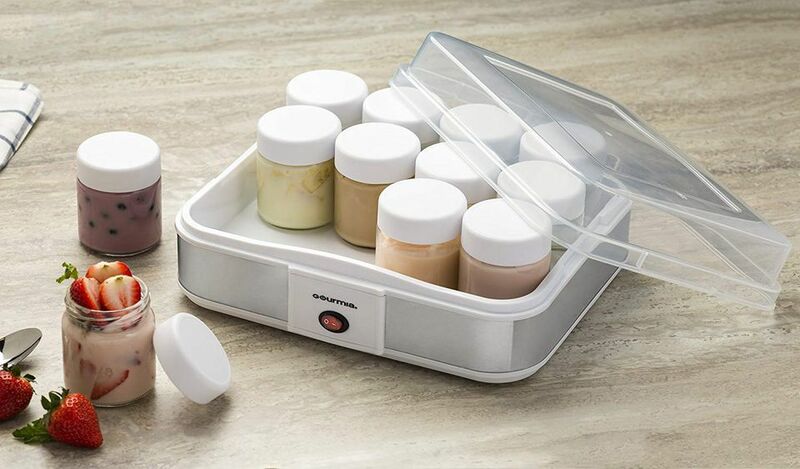 This budget-priced yogurt maker comes with seven 6-ounce glass containers for making individual servings of yogurt. The jars have lids for storage and both jars and lids are dishwasher safe. Numbers on the side of the unit light up to show the progress of the yogurt making. This operates with a simple on/off switch and has a light that indicates that it’s on. There is no auto-shutoff, so you’ll need to be nearby to turn it off when fermenting is done. Not only does this machine keep a constant temperature for fermenting the yogurt, it automatically switches to a cooling mode when the time is up, so you don’t have to be present to turn the machine off, and since it starts cooling, there’s less chance it will become overly-tart from longer cooking. Operation is simple—just add the yogurt and starter and set the fermenting time. Then remove the container any time after the fermenting is done, and refrigerate it. This holds up to 50 ounces of yogurt in one large batch. If you want to try your hand at making yogurt, but you also want a device that can do other things, the Instant Pot is a good choice. It has a yogurt-making function, but it is also a fully-functional pressure cooker and slow cooker. You can scald the milk in this cooker, then let it cool before adding the starter and setting it to ferment. The time is adjustable for different yogurt preferences and the stainless steel cooking pot is dishwasher safe. Compared to stand-alone yogurt makers this is expensive, so if your only intended use is yogurt, it’s not very budget-friendly. This yogurt maker can handle up to two quarts of yogurt and cooks it in a removable lead-free clay cooking liner with a glass lid. This gadget also functions as a slow cooker for making soups, stews, and other foods. It has three temperature settings: low, high, and yogurt. The clay liner takes a little more care than metal, plastic, or glass, but it’s the ideal cooking material for folks who prefer more natural materials. Most of the yogurt makers that use single-sized jars can make six or seven jars per batch, but families who love yogurt might find themselves making yogurt several times a week to keep up. This yogurt maker has space for a dozen jars, so you won’t need to make yogurt as often. Operation is easy — just flip the switch and let the yogurt ferment, while the individual jars let you customize flavors or remove some earlier than others. Designed with Greek-style yogurt in mind, this includes a set of six jars for making person portions as well as a 17-ounce plastic container for making larger bulk batches. The included strainer is uniquely designed for turning standard yogurt into thick Greek-style yogurt. The drained whey can be used for baking, in smoothies, or added to soups, stews or other recipes. When you’re done making yogurt, the jars, the plastic container, and the strainer all fit into the unit for neat storage and so you will always be ready to make another batch. Once you’ve made your own yogurt, you might want to strain it to thicken it to a Greek yogurt consistency, or even make yogurt cheese. Yogurt cheese can be as thick as cream cheese and can be used in the same way. This strainer makes it easy to strain your yogurt to any consistency you like. It includes a plastic container to contain the whey, a fine mesh stainless steel strainer, and a lid. This will turn 3 cups of yogurt into 1 cup of yogurt cheese and 2 cups of whey in up to 24 hours, depending on the yogurt. For a Greek style yogurt, you simply stop the straining process when there’s about 1 1/2 cups each of whey and yogurt. The container seals securely, so it won’t absorb refrigerator odors during straining. All parts are dishwasher safe for easy cleaning.